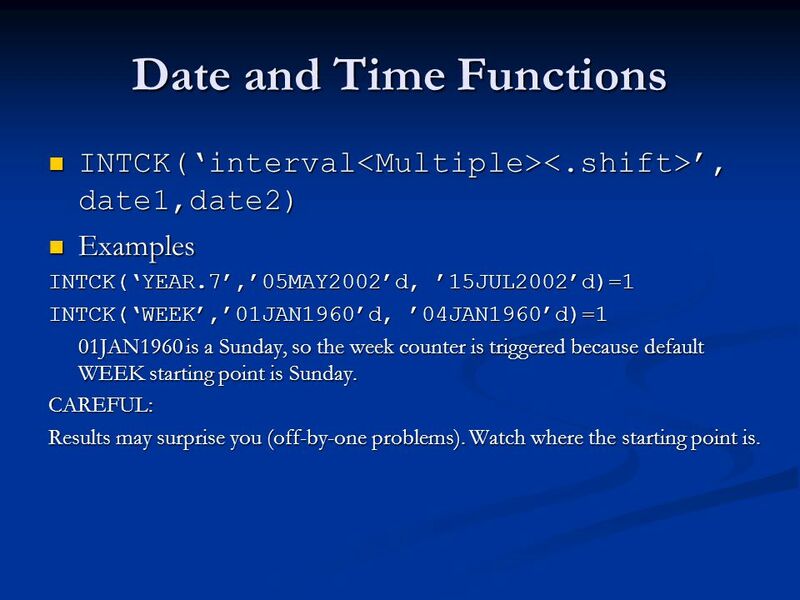 INTCK(‘interval<Multiple><.shift>’, date1,date2) Examples INTCK(‘YEAR.7’,’05MAY2002’d, ’15JUL2002’d)=1 INTCK(‘WEEK’,’01JAN1960’d, ’04JAN1960’d)=1 01JAN1960 is a Sunday, so the week counter is triggered because default WEEK starting point is Sunday. CAREFUL: Results may surprise you (off-by-one problems). Watch where the starting point is. 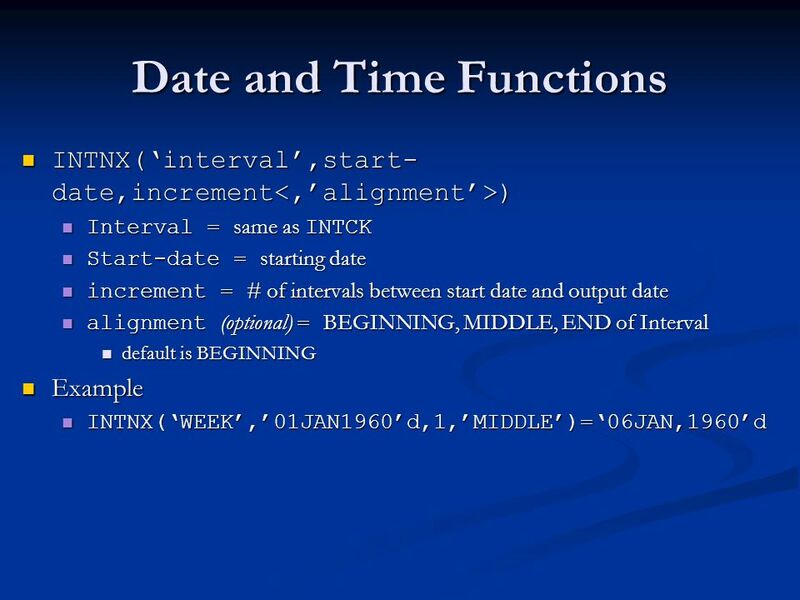 Download ppt "Examples from SAS Functions by Example Ron Cody"
Dates and Times SAS Date, Time and Date- Time Formats. 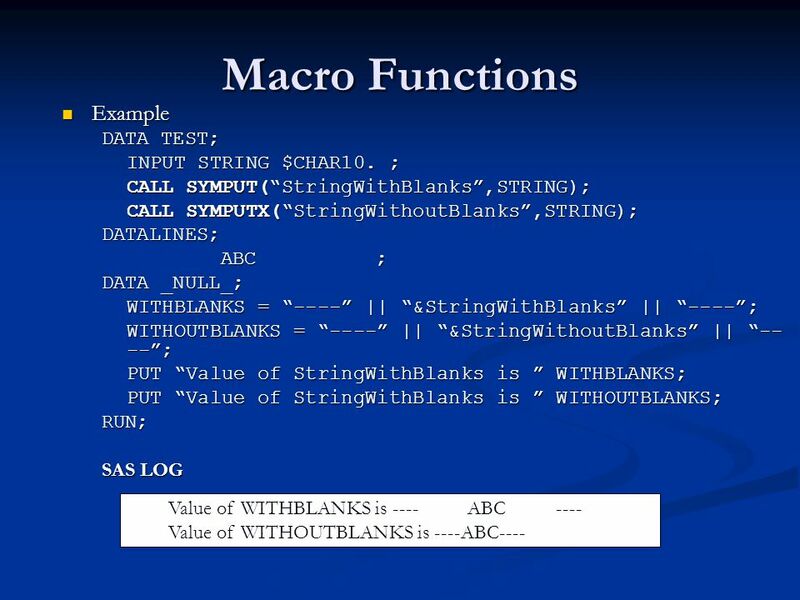 The INFILE Statement Reading files into SAS from an outside source: A Very Useful Tool! 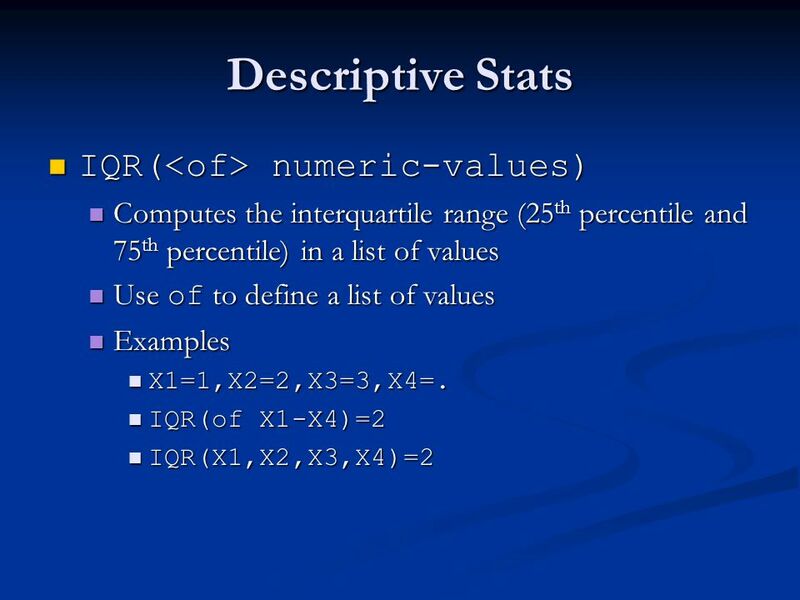 Statistical Methods Lynne Stokes Department of Statistical Science Lecture 7: Introduction to SAS Programming Language. 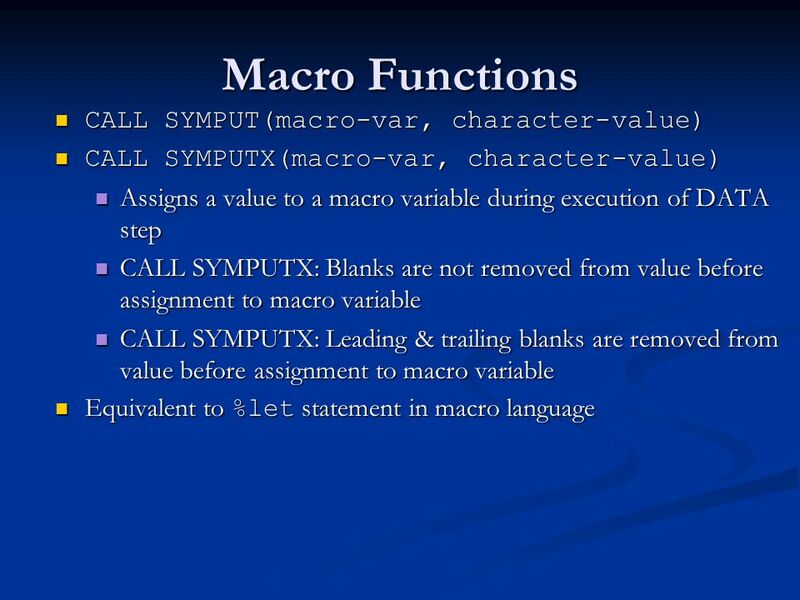 MIS: Chapter 14 Cumulative concepts, features and functions, plus new functions COUNTIFS, SUMIFS, AVERAGEIFS (Separate ppt on REACH.louisville.edu) All. Outline Proc Report Tricks Kelley Weston. 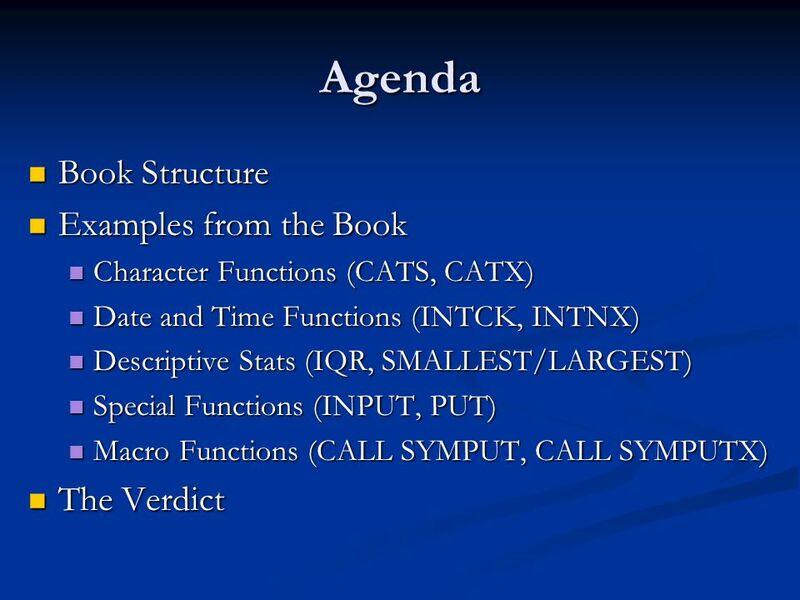 Outline Examples 1.Text that spans columnsText that spans columns 2.Patient-level detail in the titlesPatient-level. 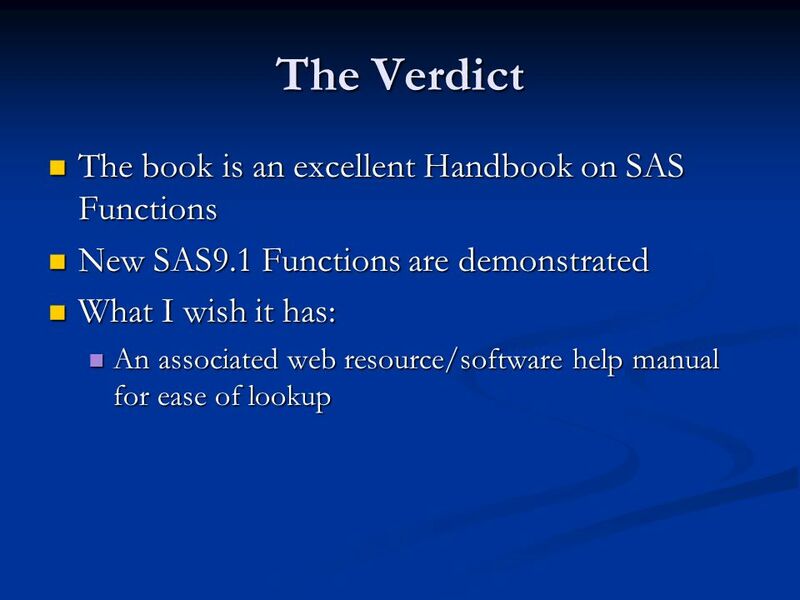 Statistics in Science  Introducing SAS ® software Acknowlegements to David Williams Caroline Brophy. 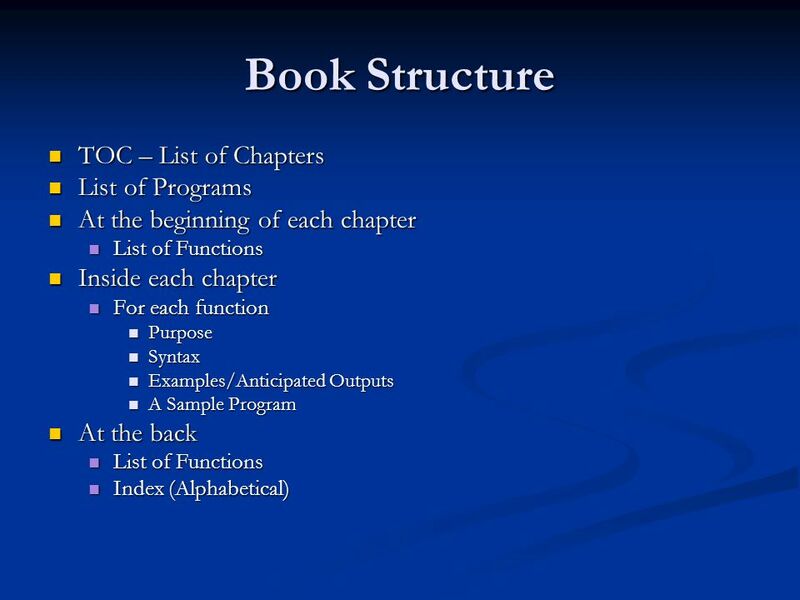 I OWA S TATE U NIVERSITY Department of Animal Science Modifying and Combing SAS Data Sets (Chapter in the 6 Little SAS Book) Animal Science 500 Lecture. 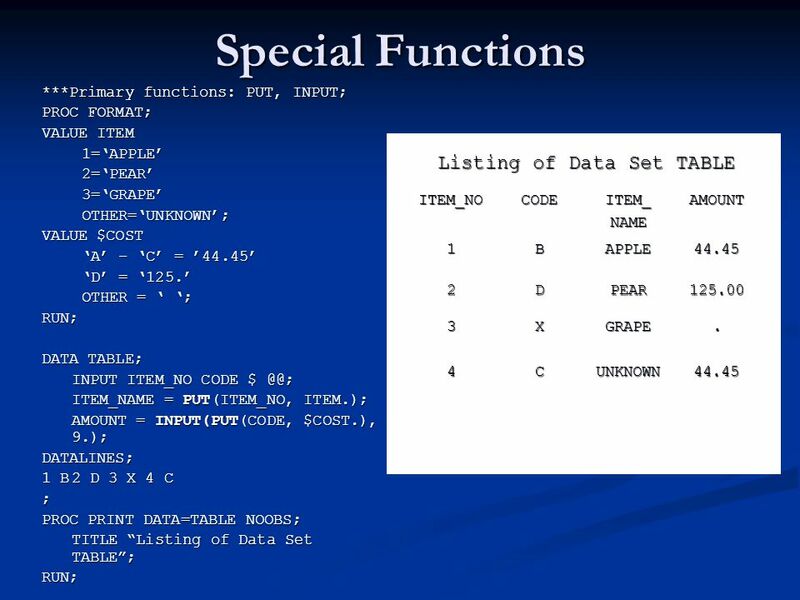 Introduction to SQL Session 1 Retrieving Data From a Single Table. Jeremy W. Poling B&W Y-12 L.L.C. Can’t Decide Whether to Use a DATA Step or PROC SQL? 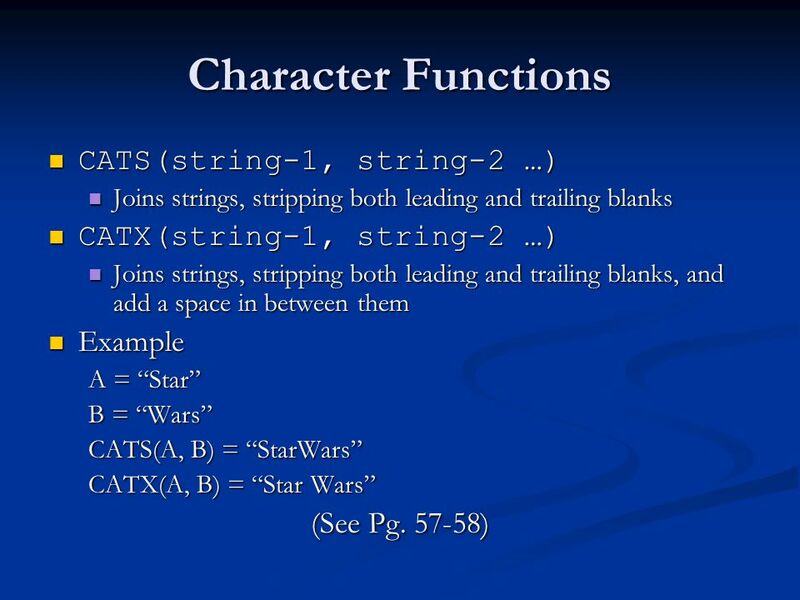 You Can Have It Both Ways with the SQL Function! 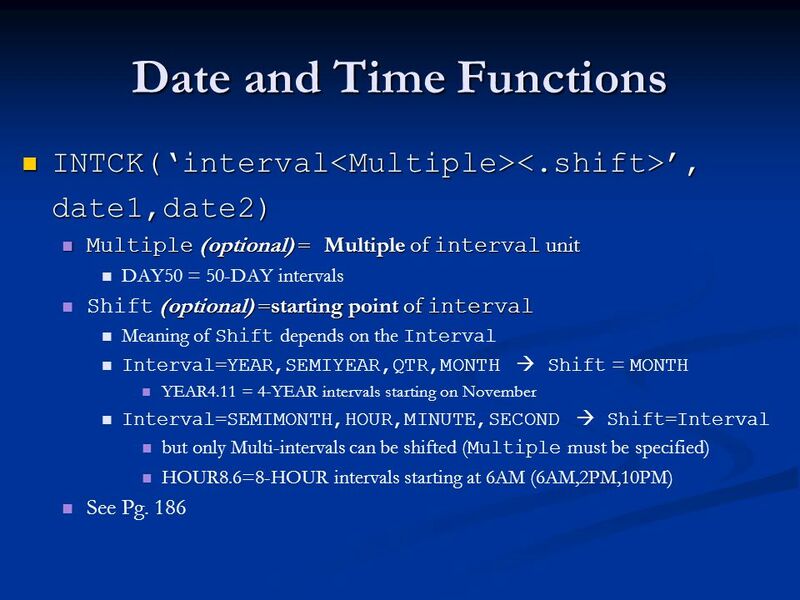 Chapter 18: Modifying SAS Data Sets and Tracking Changes 1 STAT 541 ©Spring 2012 Imelda Go, John Grego, Jennifer Lasecki and the University of South Carolina. 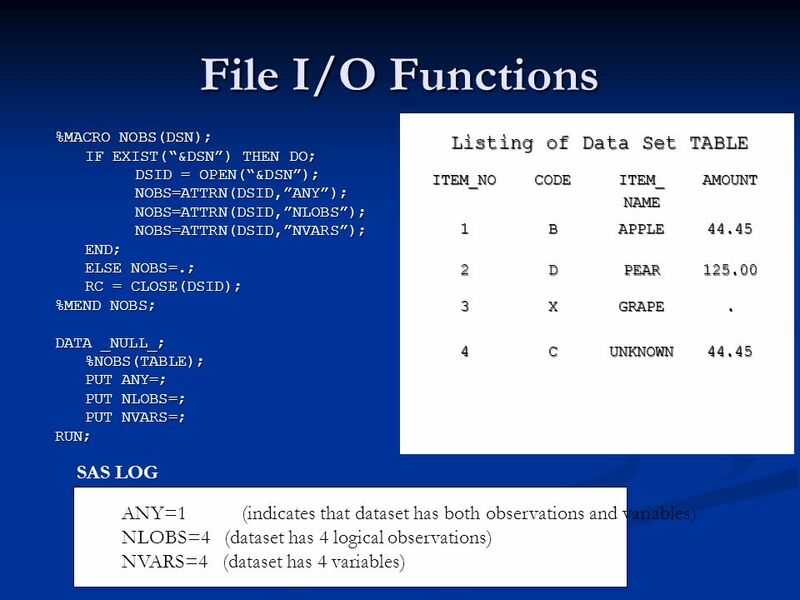 Understanding SAS Data Step Processing Alan C. Elliott stattutorials.com. 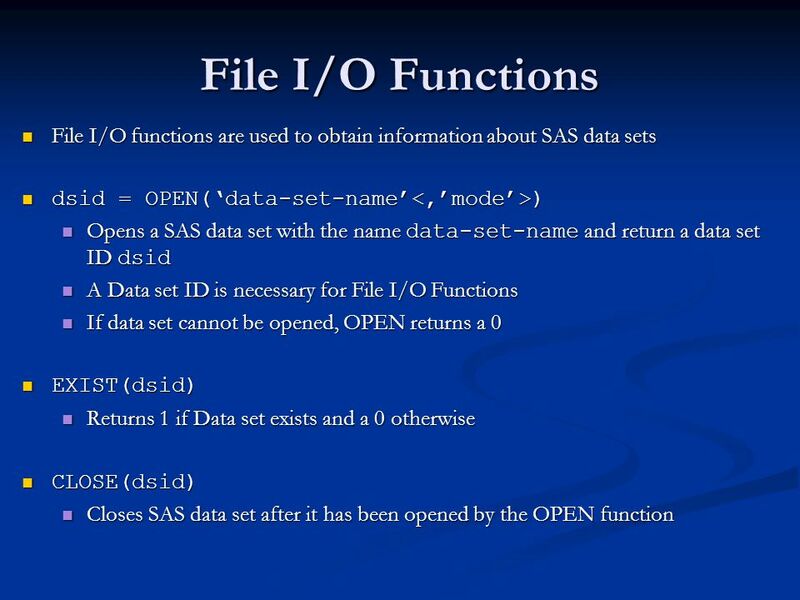 Into to SAS ®. 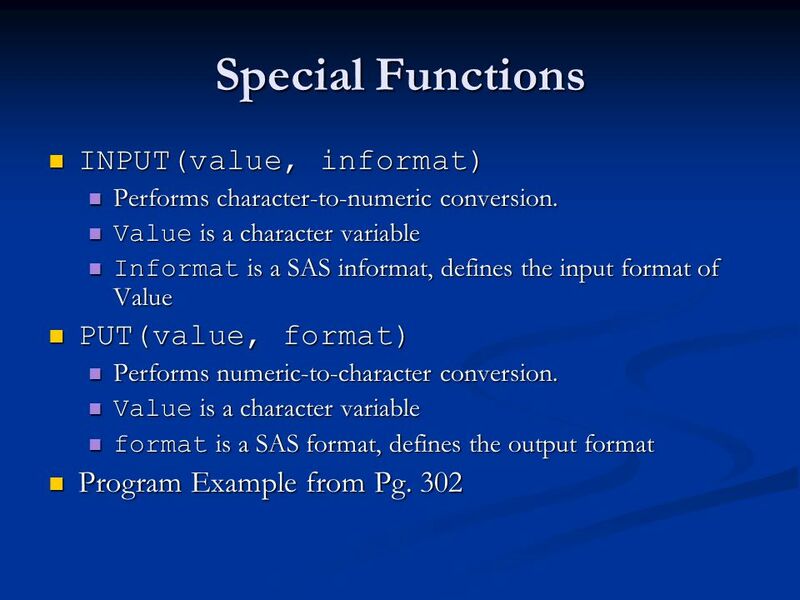 2 List the components of a SAS program. 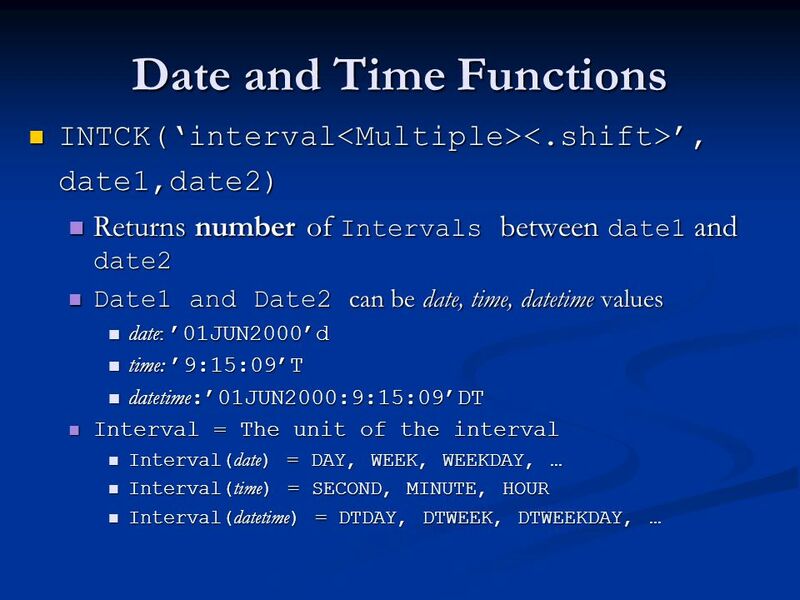 Open an existing SAS program and run it. Objectives. 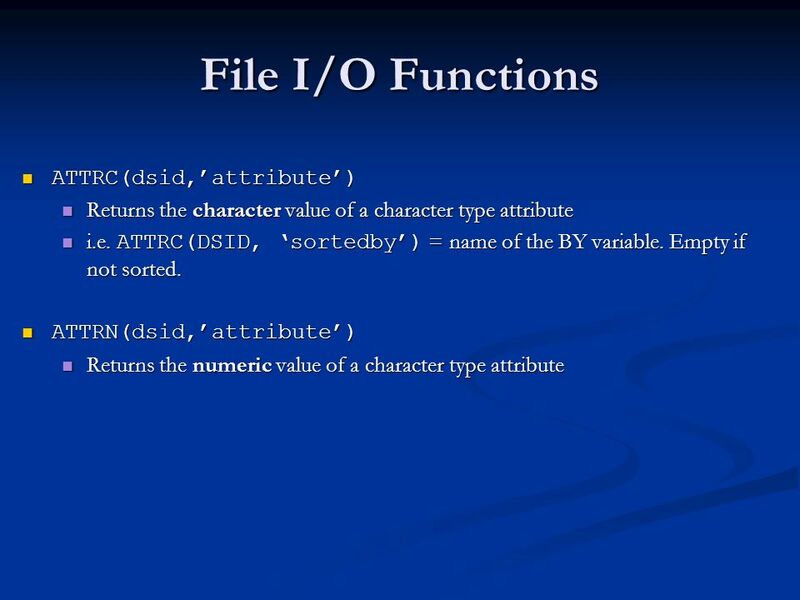 Data Cleaning 101 Ron Cody, Ed.D Robert Wood Johnson Medical School Piscataway, NJ. 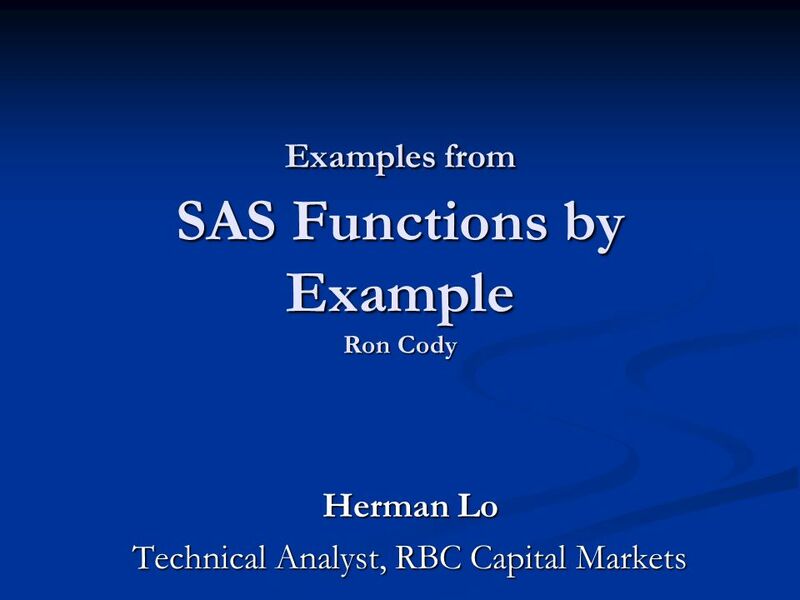 Welcome to SAS…Session..!. What is SAS..! 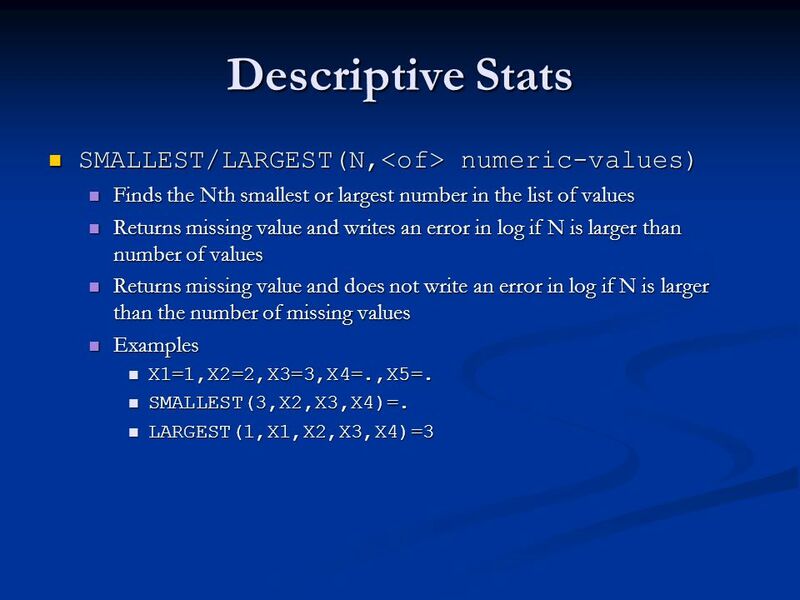 A Complete programming language with report formatting with statistical and mathematical capabilities. 1 PhUSE 2011 Missing Values in SAS Magnus Mengelbier Director.